In order to test new interaction concepts and technologies and to make them tangible, we have developed a hands-on Smart Factory showcase with the HoloLens. 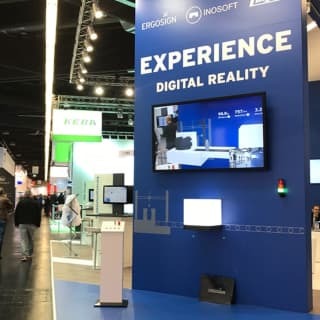 This showcase was aimed to be applicable in the context of trade fairs as well as in any regular room to provide everyone with easy access to mixed reality. The showcase represents a bottle production line consisting of a combination of physical hardware elements and projected holograms of the HoloLens: The production line itself is completely simulated by a 3D model and is only visible to the HoloLens wearer. A control panel, a material testing system (indicated by a luminous acrylic glass element), as well as an industrial traffic light, form the only physical components of the machine. In our scenario, the machine operator - the wearer of the HoloLens - is guided through a repair scenario. He must rectify a multi-stage malfunction unknown to him, in which both a faulty bottle must be classified and a production jam must be cleared. Detailed troubleshooting instructions are displayed directly and precisely on the machine's operating panel via the HoloLens. Additional information, such as the general status of the machine and the bottle inspection process, is displayed by the acrylic glass element and an industrial traffic light. "The free interaction in the spatial context opens another exciting dimension for UX designers to support the user even better in his or her tasks." Mixed Reality (MR) is characterized by the fact that the information displayed via the data glasses includes the real environment and not, as in Augmented Reality (AR), merely fades in. Holograms can thus be aligned relative to objects in the spatial context and do not orient themselves statically to the user's field of vision. In addition to being used for repair situations, the technology can also be used in industry for employee training, remote maintenance or machine conversions and retrofits. Interactive 3D models and holograms can also be used in other industries, such as architecture, medicine or the consumer market, to improve learning effects or create new viewing experiences. Our showcase convinced several times: both the jury of the INNOVATIONSPREIS-IT and the INDUSTRIEPREIS decorated it with the award "BEST OF 2018“. We are proud of the awards and are delighted for our colleagues, who were able to establish technical know-how and to explore new forms of interaction in this exciting project.